Natasha Ness: When you have so many different departments that you’re working with, and everyone’s writing content in all different ways, there’s a huge lack of visibility. For me, organization is about having that visibility. Lauren Witte: If I’m writing, especially if I’m doing a full content rewrite for a website and it’s the first time I’m dealing with a client, something I really love to do is meet with the client face-to-face and record the entire discussion. Chels Knorr: Keep the client updated. I try to find the simplest or quickest way possible to let them know where everything is at. Brittany Berger: I try hard to get as few stakeholders involved in the process as possible, not even because of what it does to the copy, but also because of how much extra time it makes everything take. 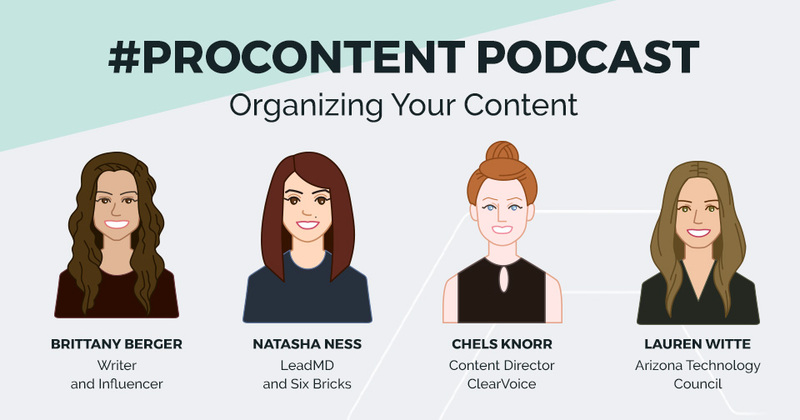 Chels Knorr: You need to learn the ins and outs and the intricacies of how all these other departments run in your company in order to manage the people in them when they’re involved in content. Brittany Berger: Outlines are really underused. They help keep everybody on track. Natasha Ness: I’m also a Mom, and I have a long commute, I just record myself on the phone. So if there is something that I really want to write about that I know I’m not going to be able to do it that day, I just start recording on my mic on my phone, and that’s a way for me to kind of get ideas out too. Lauren Witte: Make sure that all that content is edited correctly before you submit it over to the design team – this is pretty huge. Do you have any tips or thoughts on organization that we didn’t cover here? Any questions we can help answer? Please leave your comments below.